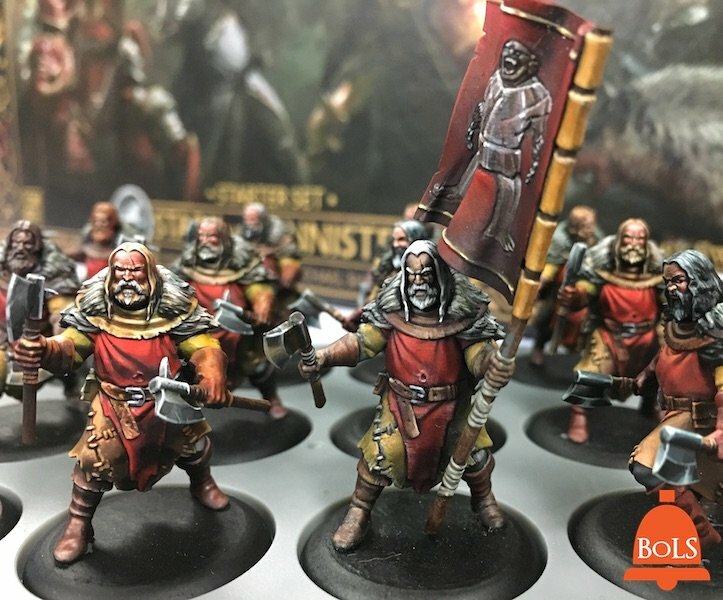 Is rank-and-file miniatures combat your thing? Well get ready for a new game that is going to have you pushing blocks of infantry around – CMON’s new A Song of Ice & Fire Miniatures Game is coming soon and we got a preview for you! We got to spend some time last year with co-designer of A Song of Ice & Fire Michael Shinall. We were pretty impressed by the game inspired by George R.R. Martin’s A Song of Ice & Fire books (not the Hit HBO TV Show set in the same universe). I really enjoyed the gameplay and the models looked pretty amazing as well. Typically when you see the demo pieces, they are prototypes or custom to show off the game in the best possible way. You tend to lose some of that when you get to the actual production copies. I’m very happy to say that is NOT the case with A Song of Ice & Fire! The miniatures might not have been painted by a pro-studio, but the bare plastic looked pretty darn good. Right out of the box ALL the miniatures come pre-assembled and on bases in colored plastic. It’s good quality plastic too! It’s not the cheaper, mushy PVC or some type of hard rubber model. No – this stuff is solid, crisp, and holds detail. On top of the 103 miniatures you get, you also get everything you need to play. And we mean everything – from dice, to range rulers, to tokens, movement trays, decks, a scenario/rules book and even terrain! Get this on a table and start playing. It might have taken a little longer than expected to get the product in our hands, but I think it’s been worth the wait. This entire set is high-quality and I’m impressed with how it’s been put together. In the video, we go through the entire box and the rulebook, but we don’t tackle game-play too much. But don’t worry, we’ll be showing off more of that later. This is a product that we think is going to do very well in the long run with many, many expansions (ie units) coming down the pipe. You can already see the seeds of the future of this game hinted at and we can’t wait to see even more for this one. 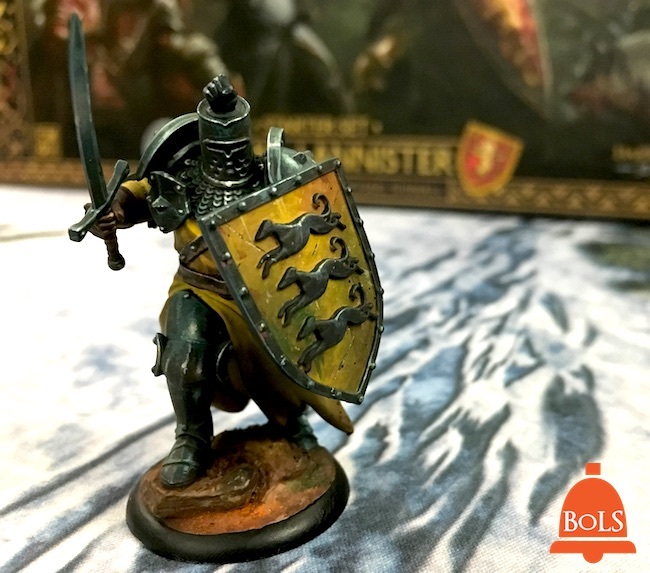 A Song of Ice & Fire: Tabletop Miniatures Game is a competitive miniatures game for two or more players. 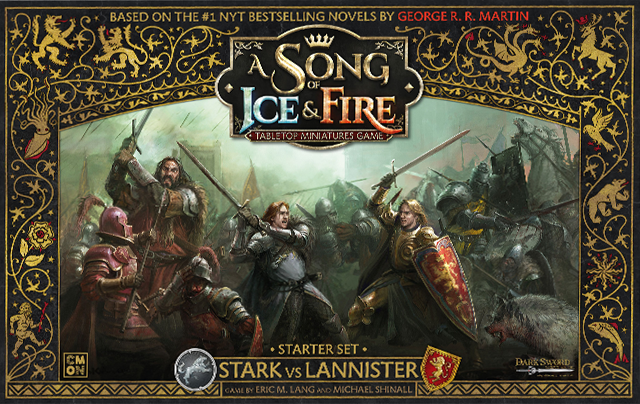 Each player controls one of the Great Houses of Westeros, commanding battlefield units, recruiting legendary Heroes, and manipulating the political stage, in the attempt to claim the greatest prize of all: The Iron Throne. Featuring House Stark and House Lannister, the Starter Set comes with over 100 amazing, preassembled miniatures that are ready to play out of the box! All-new sculpts are based off original art created for the game by our crew under the direct supervision of George R.R. Martin and Dark Sword Miniatures, to ensure that the game delivers what fans have been envisioning for years. The War for Westeros is coming to retail soon.